At Southampton docks Jill drives up. She rushes out of her car and to the dock side where the Queen Elizabeth II is moored. Jill goes on board the ship and walks along the corridors looking for a particular room. She finally finds the room she is looking for and opens the door. Meg Mortimer is sitting on the bed. Jill runs up to her mother and hugs her. Meg tells Jill that she said she would phone her in the note. "Note?" asks Jill. Meg tells Jill that she left Jill a note in the pigeon hole in reception. Meg tells Jill that she is going away and Jill asks her how long for. "For good. My life at the motel is finished," says Meg. "It's David Hunter isn't it? I hate him," says Jill. "You musn't. He isn't the only reason," says Meg. She says things have never been the same since Sandy died. Jill asks her what she did after she went to her room, and Meg says she wrote a letter to Jill, then she put the letter in the pigeon hole in reception. Meg laughs and says the letter is probably still in the pigeion hole. She says she then took one last look at the motel and left. Jill asks Meg why she didn't come and find her and Meg says she would have seen David and Adam and they would have tried to stop her from leaving. 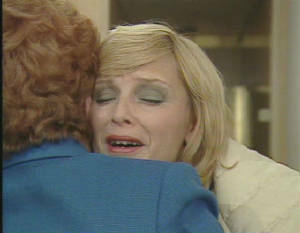 Jill realises that her mother doesn't know about the fire at the motel and decides not to tell her. An announcement comes over the tannoy asking that all people not sailing disembark. "It's time to go," says Meg, and they hug. Jill waves to her mother from the dockside as Meg sails away to her new life. David Hunter joins Adam and Sharon in the office. Adam asks if there is any news about Jill and David says no. Adam tells David that there is going to be an inquest on Sam Hurst. He tells David that he is certain the Detective Inspector Watkins suspects him of having something to do with the fire. Detective Inspector Watkins joins David, Sharon and Adam in the office and tells David that he just wanted to make sure that he got the message about the inquest. The Inspector leaves the office. The telephone rings and Sharon Metcalfe answers it. She hands the phone to David Hunter and tells him that it's Jill. David takes the phone. "Tell me what happened," says David. The phone goes dead and David tells Adam that Jill said she would explain when she got back. Adam tells David that he is glad he and Barbara are back together again. "It's a relief," he says. "What?" asks David. "You were terrible," says Adam and David laughs. David says for the moment the office is acting as the reception. "Reception for what?" asks Adam. David says most of the chalets survived the fire and if they were to close now they would be written off for good. "You're right. You know for the first time I think we're going to survive," says Adam. "Survive. Of course we'll survive," says David. Benny goes to the garage dressed in a suit and Sharon Metcalfe tells him that Adam Chance is in the garage office. Benny goes into the office and tells Adam Chance that he has come about the job. Adam tells Benny that they don't really need anyone. Sharon Metcalfe see's Benny when he comes out of the office and asks him how he got on. Benny tells her that he isn't needed. Sharon tells him that they do need someone and tells Benny that she will see what she can do. Sharon Metcalfe goes into the garage office and tells Adam Chance that they could use Benny. Adam says Benny can be stubborn but Sharon says he is a good worker. Adam Chance goes out of the office and into the garage workshop. He calls Benny back and asks him if he really wants the job. Benny says yes, and Adam tells him that he has got it. Jill Harvey goes to the motel office and David Hunter asks her where she has been. Jill tells David that she wants Adam here. "Where have you been?" asks David. "To see Mum," answers Jill. David looks at her. Iris Scott asks Ron Brownlow what would happen if he couldn't make it back to Birmingham when he goes to work on the oil rigs. Ron tells her that he would ahve to stop over, and Iris says he would get bored. "Ah, a bit of spare on the side," says Ron. Iris says it does happen but Ron tells her that he isn't interested. "I've got what I want with you and there's no way that I'm going to mess that up," says Ron. Jill tells Adam and David that Meg has left. She says David was getting too ambitious for her liking. Adam says at least she could have said goodbye but Jill says she didn't want to because she knew they would try and stop her. Jill tells them that Meg left before the fire and knows nothing about it, and she didn't tell her. "This is rediculous," says David. He says they have a crisis and a major share holder is cruising around. "There are decisions to be made," he says. "That's been taken care of David," says Jill. David looks at her. "Mum has made all her shares over to me. I hope you don't object," says Jill. Detective Inspector Watkins tells Adam that Sam Hurst wasn't burnt to death, he was overcome by fumes. Kevin Banks tells Glenda that he will have to take his van into the garage because there are a few things wrong with it. Arthur Brownlow tells Kevin that the motel will want some decorating done and that will be good for someone. "Yes. Me, I hope," says Kevin. Kath Brownlow tells Arthur that it doesn't seem right for Iris Scott to be stuck at that flat on her own whilst Ron is away. Arthur guesses that Kath wants Iris to come and stay with them and Kath says she is going to be their daughter in law and she is carrying their grandchild. Kevin Banks goes to the motel garage and congratulates Benny on his job. Kevin tells Benny that he was sorry to hear about his friend Sam Hurst, and says it wasn't his fault as he was a bit sick in the head. "What happened to his family. It was an accident!" shouts Benny. Barbara Hunter tells Adam Chance that David has gone to see the bank manager about a loan to see them through until the insurance company pays up. Barbara tells him that she had a talk with Jill and they had a frank exchange of views. Barbara tells Adam that Jill blames David for what happened. "How do you defend the undefendable?" asks Adam. Percy Dobson arrives at the motel and meets Kevin Banks in the corridor. Percy Dobson tells Kevin that he is after the re-construction work. He knocks on the door of the motel office and goes inside for a meeting with Adam Chance. "I got your phone call. Came straight away," says Percy Dobson. Kevin Banks, outside in the corridor beside the office, hears the exchange. "It's not my day is it," mutters Kevin. Kath Brownlow asks Glenda about Iris Scott coming to stay with them. "If you like," says Glenda. Kevin Banks arrives home feeling a little depressed. He tells Kath and Glenda that Percy Dobson was at the motel and he is after the re-construction contract. Arthur tells him that he should find out where he stands and get something in writing. Benny tells Diane Hunter that Adam Chance said he should move Sam Hurst's things out of Stonebank Farm. Diane tells Benny that she doesn't think he should touch them as the police might need them for the inquest. Diane tells Benny that the police will want to know why Sam asked Benny to buy those fireworks. She says everyone thinks Sam used the fireworks to start the fire. Benny says it makes him angry when people say things about Sam. "Oh come on Benny," says Diane. "You don't understand. He was my friend," says Benny.